Iran is openly venting its frustration over a US organized international conference on the Middle East in Warsaw next month, which could be a new phase of international confrontations against the Iranian regime. 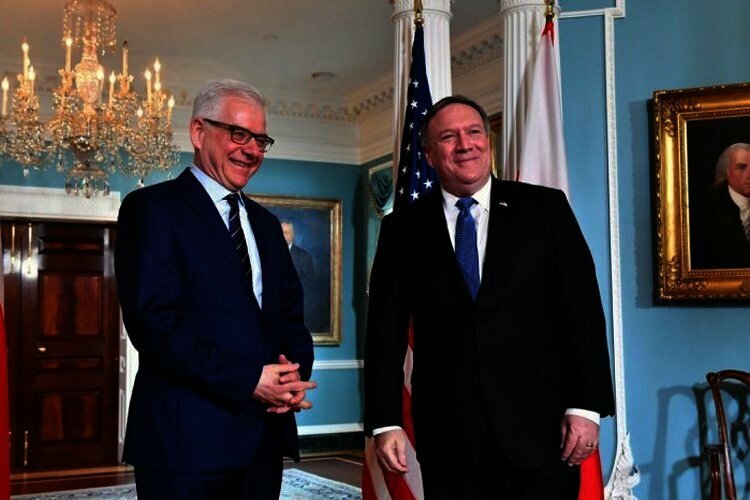 The US has officially announced that the Warsaw conference was aimed generally at promoting a future of peace and security in the Middle East and specifically at “Iran’s destructive policies in the region”. Iran has not been invited to the conference. The conference, which US Secretary of State Pompeo said will draw ministers from around the world, starts two days after the regime celebrates its 40th anniversary. The regime sees the summit as a hostile act and summoned a Polish diplomat to protest the conference. Iranian officials and heads of Friday prayers who convey the Supreme Leader’s opinions have tried to downplay the importance of the conference. But what is evident from all their remarks is an underlying fear of what the conference would mean in terms of a coalition against the regime’s 30 something year strategy of terrorism and meddling in the region. “The goal of the world arrogance (the US and its allies) is removing the axis of resistance in the region. A US diplomat has announced that the meeting would talk about the need to take action against the missile program … and the unacceptable provocative actions by Iran and Syria and the firing of rockets against the Zionists,” Mohammad Ali Al Hashem, the Tabriz Friday prayer leader and Khamenei’s representative in the northwestern province of East Azarbaijan said. “With the help of their media, the enemies have always tried to show that Islamic Iran is seeking to produce weapons of mass destruction, and ballistic missiles with nuclear warhead capabilities, and that we support terrorism, cause insecurity in the region, interfere in the affairs of other countries in the region, threaten Israel, ignore women’s rights and eliminate political freedoms… Some of these hostilities are carried out directly while some of it is carried out via other countries by force. Now they are wandering around the world seeking to introduce Iran as the cause of insecurity in the region,” the leader of the Fars Friday prayers, Talebi, said on the Warsaw conference. Alaeddin Boroujerdi, a senior member of Iran’s Parliament said that the US “aimed to encourage Iran-phobia and to increase pressure against the Islamic Republic of Iran with the anti-Iranian summit”. Iran’s former ambassador to Italy, Seyed Mohammad Ali Hosseini, also stressed that “Trump and his team have put many options on the table for the Islamic Republic’s submission”. “The Trump team is contemplating a renewal and strengthening of its coalition, centered on hostility with the Islamic Republic. The Poland summit can be analyzed and evaluated in this regard,” he wrote. Ali Khoram, Iran’s former ambassador to the UN in Vienna, warned that the summit could herald a military coalition against the regime. “If Mike Pompeo succeeds in turning the Polish propaganda summit to a political summit, it will be a prelude to a military alliance against the state,” he wrote in Iranian state media. The official also expressed concern over the increasing isolation of the regime. “Everyone is quick to put their differences aside upon calls from America to engage in hostility with the state. It does not seem like the state has even one real friend willing to stand against this heavy political wave and support the (regime),” Khoram wrote. On the other hand, Heshmatollah Falahat-Pisheh, a conservative lawmaker who heads parliament’s influential national security and foreign policy commission, claimed that the timing of the “anti-Iranian” Poland conference which is two days after “the magnificent anniversary ceremony demonstrates the idiocy of the Americans”. “The Warsaw summit will be overshadowed by the presence of millions of Iranians in the anniversary rally,” he claimed. The annual government rallies held to commemorate 22 Bahman is largely shunned by ordinary Iranians though school students and government employees are forced to participate. The top foreign policy official also tried to downplay the significance of the meeting and what it would mean for the future of the regime. “According to the issues to be discussed at this meeting, the Polish summit is a retreat of sorts by America from its anti-Iranian policies. Prior to this, the United States unsuccessfully sought to raise the issue of Iran in the Security Council. It then sought a regional consensus against Iran, but did not succeed and was finally forced to leave the region, which was a source of frustration for the Americans,” the top foreign policy official said. In addition to Arab ministers who will participate in the Warsaw conference, the Guardian said that UK Foreign Secretary, Jeremy Hunt, had also agreed to attend the summit on the condition that the US secretary of state hosts a meeting on Yemen on the summit’s margins. In any case, the number of participating countries in the conference dwarfs in comparison to the conference in general, which is a turning point against Iran’s destructive policies in the region. This is the first time in the history of Iran-US relations that America has sided with the people of Iran rather than the regime in power. In the past 100 years, despite the struggles of Iranians for freedom and democracy, Iran has never experienced a democratic government elected by the people. The conference indicates that the general strategy of the US and with it the international community has now leaned towards the aspirations of the Iranian people for freedom. The conference is a beginning to an end to decades of indecisiveness, indifference, and sometimes cover up of the regime’s interventions in the region and its policy of warmongering and terrorism.